Once thought extinct, Elephant Seals have made a resounding comeback. Go the to scene of some real wildlife excitement. Hearst would have loved it, right there in his front yard! Molera State Park is a mostly wide open, wind-swept canvas where the Big Sur River runs wild to the sea. Seven and a half square miles of wilderness, 21 miles south of Carmel, along the ocean, into the mountains, and complete with a wild and scenic river – Andrew Molera State Park is a great favorite for outdoor enthusiasts. A variety of interesting trails, most with incredible views, and a 24-site walk-in campground make Molera an engaging place to stay awhile. The State Park Service is restoring native grasses to reclaim a major aspect of the park from its dairy farming past. And the old pioneer home is now headquarters to the Molera Cultural and Natural History Center. The “creamery” – a grazing field for Molera’s cows – is being restored to its native state. The dairy was home to the first large commercial production of Monterey Jack Cheese. Wild sweetpeas (right) make their appearance in the spring in Big Sur. There are scenes in all directions worthy of contemplation, or serious artistic endeavors. … such as a long beach with a connoisseur’s collection of driftwood. “You’ll encounter massive, jumbled piles of silvery-blonde, storm-polished driftwood. For two miles along the shoreline, besides the pounding surf and wind-sculpted scenery, you’ll find an endless assortment of whimsically artistic beach shelters, some well-engineered, created from the poles of trees, lumber, branches, logs, and other flotsam brought in with the winter’s winds and waves. Pico Blanco from the mouth of Big Sur River. A 600 million ton chunk of white gray marble that migrated from Mexico presides over the Molera park. It is the dominant feature of the north westernmost portion of the Santa Lucias. Ohlones believed Coyote, the Creator of people and other creatures, resided here. Pico Blanco, Spanish for White Peak, with its 3,701 ft. is privately owned. An effort by the owners to quarry the marble has been stalled by environmentalists efforts to prevent it. Now, there is strong hope that Pico Blanco will be added to Ventana Wilderness. Molera’s trail system is popular for bicyclists, horse riders, joggers and hikers. 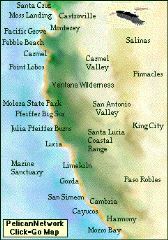 There are 20 trails, and a good map can be obtained at the entrance kiosk in the parking lot off Hwy One, or at the Big Sur Station just south of Pfeiffer Big Sur State Park. Old Coast Road begins at the northern end of Bixby Bridge, goes along the eastern slope of the canyon and into the Big Sur backwoods. Along the way groves of sycamore and redwoods congregate along streams. Bold views of the Santa Lucias, vignette scenes of remote ranches, and Pacific panoramics are plenty. The crowning achievement is when the breathtaking convergence of Big Sur River and Pacific Ocean occur at Molera State Park. Past the sandbar with the driftwood junkyard, the Big Sur River makes a lagoon for birds. Between the lonely celestial Big Sur coast and the Salad Bowl rises an exuberant new mountain range. Wildlife and habitat restoration, reintroduction, research and education. Operates the Big Sur Cultural and Historical Center at Molera State Park. If you want to join our network of conservation advocates and receive useful information about the Central Coast. cultural and natural history news and events. Call Me, I want to make a donation. What does the Pelican in our name stand for?